Continuing Light, an American Masters exhibition on view in the Patrons’ Gallery, highlights the artwork and enduring kinship of three top landscape and maritime painters: William R. Davis, Don Demers, and Joseph McGurl. Please join us for an opening reception in their honor, concurrent with the American Masters VIP Preview Reception. The artists will be in attendance. William R. Davis was born in Somerville, Massachusetts in 1952 and grew up on Cape Cod. He is a self-taught artist who spent the early part of his career as an art dealer and collector of 19th-century American works. Inspired by the artists he was collecting, he began painting full time. In 1983 he started exhibiting his work in solo and group shows across the country. Davis has a deep admiration for several of the 19th-century American Luminist painters. He continues to use many of the techniques, color, and tonalities traditionally used by these painters to realize his own personal vision. Over the course of his career, Davis became enamored with plein air painting, partly influenced by his friendship with artists Joseph McGurl and Donald Demers, with whom he painted in various New England and West Coast locations. Since then, Davis has enjoyed a national reputation as a preeminent contemporary marine artist. His work has been featured in books and in well-regarded publications, and he is the recipient of numerous awards and honors. Davis is represented by Chapman Gallery (Cotuit, MA), The Christina Gallery (Edgartown, MA), Collins Galleries (Orleans, MA), The Guild of Boston Artists (Boston), Hackler Fine Art (Milford, NH), The Maritime Art Gallery at Mystic Seaport Museum (Mystic, CT), and Quidley & Company (Nantucket, MA; Naples, FL; and Westport, CT). Donald Demers is considered one of the finest marine and landscape painters in America. The exemplary level of skill in Demers’ paintings has placed them in some of the most prestigious public and private collections in the country. The artist is a highly sought after instructor, and his teaching has taken him around the United States and Europe. His work as an illustrator has been honored four times in the annual exhibition of The Society of Illustrators. Demers’ marine paintings have garnered him a record 21 awards at the Mystic Museum’s International Marine Art Exhibition & Sale, including the prestigious Rudolph J. Schaefer Award. He has received awards for his landscape painting from The Irvine Museum (Irvine, CA), The Laguna Plein Air Invitational, and The Guild of Boston Artists. Demers is a Fellow of the American Society of Marine Artists, an elected member of the Guild of Boston Artists, a Signature Member of the Plein Air Painters of America, an elected member of the Salmagundi Club, and an elected member of The California Art Club. Joseph McGurl’s paintings have been included in group museum exhibitions throughout the country. 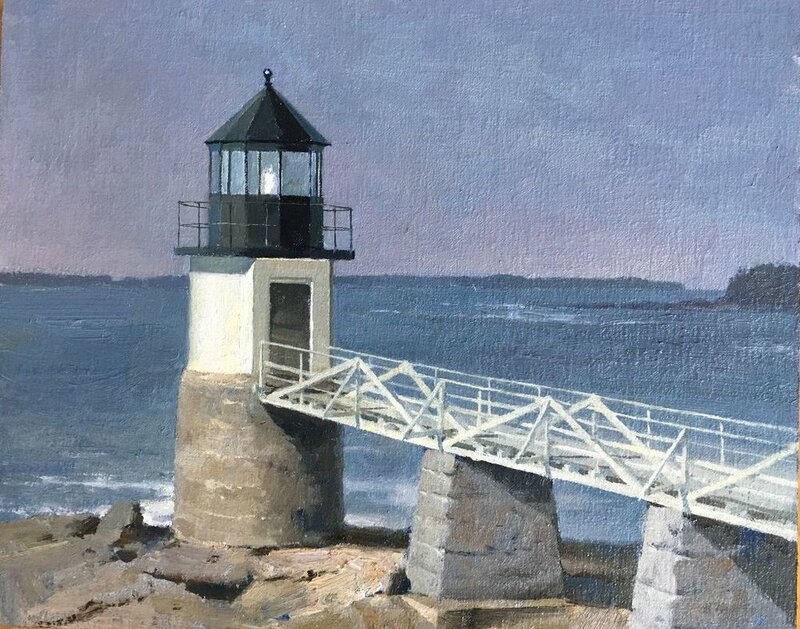 He has had retrospective solo shows at the Cape Cod Museum of Art (Dennis, MA), the Cahoon Museum of American Art (Cotuit, MA), and the St. Botolph Club of Boston. His work was also included in The Arnot Art Museum (Elmira, NY)’s Representing Representation series of exhibitions as an example of contemporary landscape painting. McGurl’s paintings are in the collections of the New Britain Museum of American Art (New Britain, CT), the Cape Cod Museum of Art, the Cahoon Museum of American Art, The Mellon Collection, The Forbes Collection, Christopher Forbes, and Sen. John Kerry. McGurl has been designated a Living Master by the Art Renewal Center and has been elected to the Guild of Boston Artists. A former Copley Master with the Copley Society of Art (Boston) and Fellow with the American Society of Marine Artists, he is also a Signature Member of the Plein Air Painters of America. His many awards include the Guild of Boston Artists Gold Medallion, First Place in Landscape at the Art Renewal Center’s International Salon, American Fine Art Magazine’s Award of Excellence, The Rehs Award, a Purchase Award, and the John Singleton Copley Award for Artistic Achievement from the Copley Society of Art (Boston). McGurl is represented by Cavalier Galleries (New York City), Collins Galleries (Orleans, MA), and Palm Avenue Fine Art (Sarasota, FL).